Arch top curtain rods for wide windows. How t0 hang a curtain rod instructions are furnished with each rod. Brass drapery rods require cleaning, Alexandria gives you the brass look without the messy cleaning. Rods are metal, slides and finials are plastic. Projection 3 1/2 to 4 1/2 inches. Wide traverse rods by Kirsch. Superfine one way left extra long curtain rod 100"-180"
Drapery off set pins for hanging draperies to traverse rods. These pins are used to attach pinch pleat draperies to your traverse rod. The pin attaches to the back top of the drapery, pinning into the header. The hooks go into the slides on the traverse rod. 14 per bag. Kirsch basic drapery hardware. Not for flameproof fabrics. One way draw traverse rods for small windows. Super heavy duty. White finish. Note: one way right pictured. Projection, 2 3/4 to 4 1/4 inches. Clearance 2 to 3 1/2 inches. Graber super heavy duty features include a universal front loading end bracket, metal adjustable and reversible master carriers ball bearing end pulleys, a spring loaded side gate for adding or removing slides, molded, canted slides, can be converted to one way draw, scored center support base for easy mounting on narrow casings, universal cam lock stirrup, braided polyester cord, and angled tip on overlap arm. Use with tab top curtains, eyelet curtains or pinch pleat draperies. 8 foot twisted 1 inch metal curtain rod. Looks like wrought iron drapery rods. Tear drop beaded trim by Conso. Pearl Drop Fringe. Beaded Accents by Conso. Composition: 86 percent plastic 14 percent cotton. Architrac comes in many different profiles to suite the project you are working. All brackets and other components needed to complete the job are available at BasicQ. Support bracket for estate ultra 2" decorative traverse rod. Ceiling brackets for estate ultra 2" decorative traverse rod. Different sizes and colors to fit your needs. Kirsch's reputation for quality and elegance was built on Wood Trends. These classic styles in rich colors and subtle grains complement wood furniture finishes and architectural details, allowing for a totally original design statement. With a wide assortment of components such as elbow brackets, swivel sockets and holdbacks, Wood Trends is not only timely but also functional. Wood drapery rods. Bamboo drapery rods look, solid wood construction. Kirsch's reputation for quality and elegance was built on Wood Trends. These classic styles in rich colors and subtle grains complement wood furniture finishes and architectural details, allowing for a totally original design statement. With a wide assortment of components such as elbow brackets, swivel sockets and holdbacks, Wood Trends is not only timely but also functional. Decorative curtain rods smooth rings 66"-120"
Studio Coordinates custom decorative traverse rod, includes 34 ring slides. 2 1/2 to 5 1/2 inch clearance, 3 1/2 to 6 1/2 inch returns. HD27104D: Smooth decorative curtain rods with ring slides 38"-66"
3" diameter. Display color 006. Kirsch's new decorative Metal Accessories can transform the everyday into an expression that is unique and personal. Medallions and Knobs, Holdback Extensions, End Caps and Swivel Sockets ... can function alone or"pleasant harmony with other Kirsch collections like Estate Ultra and Studio Coordinates. Six designs, five finishes, unlimited possibilities. Easy conversion for Continental for corner window or bay window use. Convert Continental II 2 1/2 inch to bay or corner curtain rods. Use for corner curtain rod installations. White finish. Clearance 3 1/2" to 5". 2 1/2" wide face, white finish. Continental I Kirsch curtain rod 28"-48"
Wide curtain drapery rods by Kirsch. White finish. Clearance 2 1/2 to 3 1/2". 4 1/2" wide face. 6622-025: Continental I Kirsch curtain rods 18"-28"
6625-025: Continental I Kirsch curtain rods 48"-86"
6627-025: Continental I Kirsch curtain rods 86"-150"
This traverse rod can be bent or curved to fit your bay window or curved window. You can open and close your drapery as one continuous treatment. The rod can be sectioned for shipping, and put back together on the job. Custom made for your window! Kirsch Studio Coordinates Traverse Rods used in corner windows. This swivel corner connector allows you to connect two traverse rods together that can be mounted in a corner window or bay window. Each section will need to be opened and closed independently, but you have one continuous treatment effect. How to Use a Bay Curtain Rod for a Corner Window. Bay Curtain rod used for corner curtain rod. Since plain, simple corner curtain rods are hard to find at this time, there is an easy solution. The top image is a bay window curtain rod, the bottom image is a corner curtain rod. Both use the same corner bracket setup that allows the two corner rods to be connected. When you remove the section in the middle of the bay curtain rod, what you have left is a corner curtain rod. Kirsch has decided to keep the corner curtain rod in their selection, but it will not be back on the shelf until July. The side rods with the bay window below are only 46", but it works exactly the same as a corner rod. The price is actually a little less on this bay curtain rod than on the Kirsch corner rod. This versitile package doubles as a corner curtain rod and a bay curtain rod, all at a very good price. The item includes two side sections and a rear section. For a corner window, just use the two side sections, and for a bay window, use the two sides and the rear section. White finish. Projection 2 1/2". Two side sections 18-46", one rear section 36-63". Side sections can be used to create a corner curtain rod. 1 set per envelope. 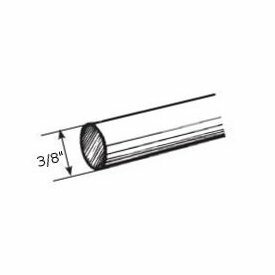 6418-025: Single corner curtain rods 28"-48"